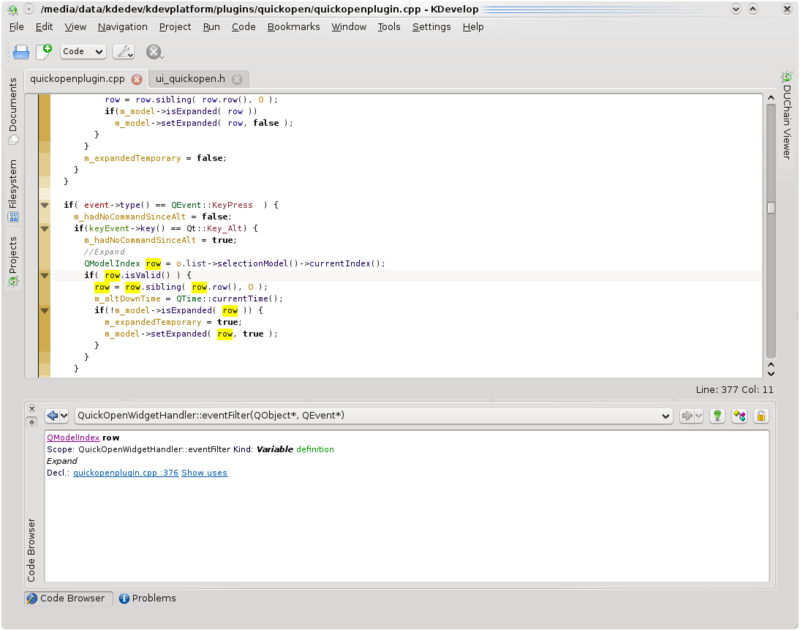 Code-Navigation in KDevelop4: Meet the Magic Modifier! 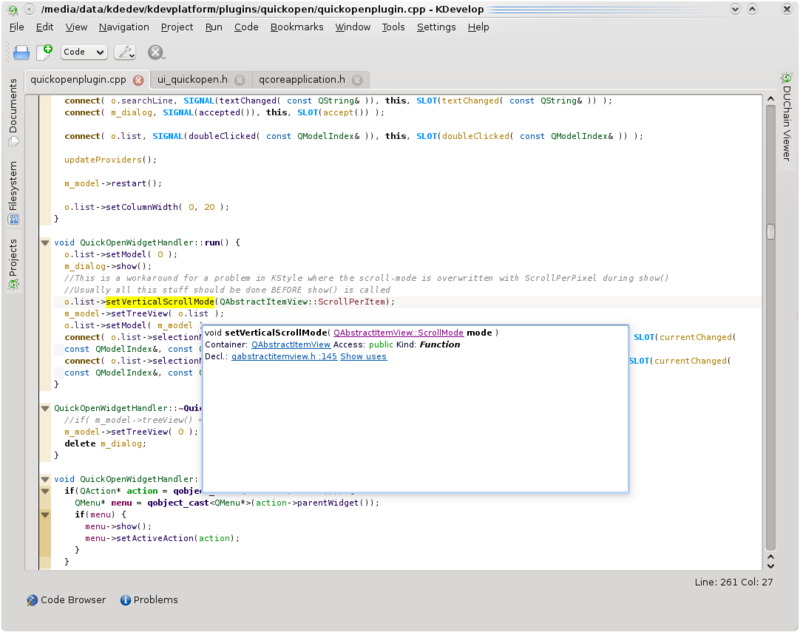 Today I’m going to blog about the various duchain based navigation and browsing features available in KDevelop4. So let’s start right from the beginning. Consider you have just opened your project. Where to start? Graphically browsing project-trees is ok to get an overview, but it’s horribly inefficient if you need to do it to reach a place you know. The Quick Open feature is the answer to that problem. 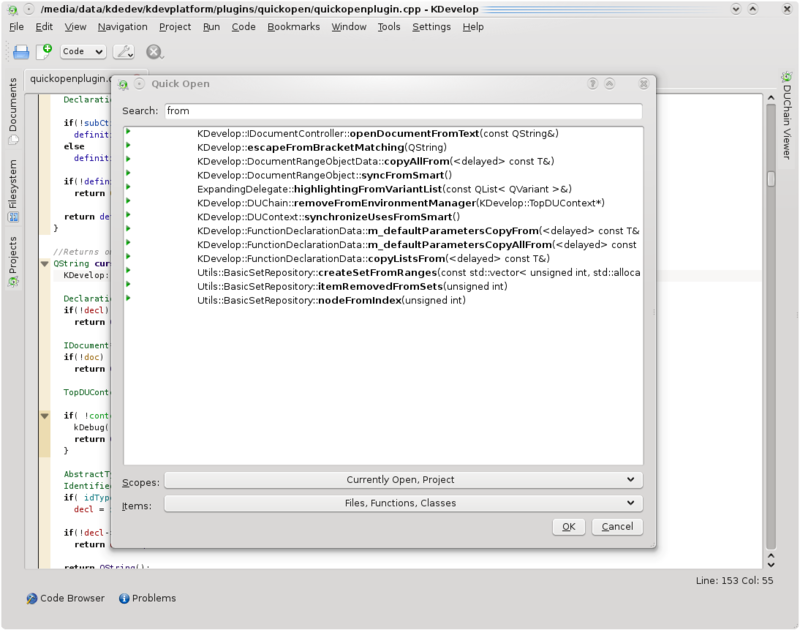 KDevelop3 already had it, and IMO it was one of it’s most productivity-boosting features. Strangely it was/is not very well known among the users I talked to. In short, the Quick Open feature is a simple list of all files, classes, and/or functions within your whole project. By typing into a line-edit you can filter that list. So now you’ve got a way to jump into arbitrary locations and get going. But what if you don’t want jump to an arbitrary location, but rather one in the same file? For this, there is an additional “Outline Quick Open”, based on the same framework, but only showing interesting items in the current file. The list can be filtered as well, but as additional gimmick the function/class you’re currently in is always pre-selected, which means you can comfortably use it repeatedly jump from one neighbour function to the next. When the duchain is working correctly, and the uses are built, nearly every symbol in a source-file is referencing a declaration in another place. That information is not only used for the highlighting, which will be the subject of another blog post, but also for direct navigation. Pushing CTRL+’.’ or CTRL+’,’ allows jumping directly to that declaration respectively definition. One of the most useful local navigation features though is the following one. As you see in the following screenshot, all uses of the declaration under the cursor are automatically highlighted in yellow. Since these highlighted uses are real “spots of interest”, it makes quite sense that the user might want to jump directly to one of them. So the shortcuts “Next Use” and “Previous Use” allow you directly cycling through them, jumping from one to the next, even across file boundaries. In my experience, since often your current interest is bound to a specific variable or function, this allows you getting where you want a lot faster. The switch declaration/definition shortcut which allows jumping directly from within a definition to the related declaration and back, perfectly complements the team. When it’s easy to jump to a random location, it should also be easy to get back. The code-browser implements an intelligent editor navigation history, that only inserts one history-entry for each function/class you’ve visited. Thanks to this, every really interesting place is in the history once, without too many useless jumps in between. Listing all the information this widget shows would not fit into this blog post. It really shows nearly anything interesting about the shown item, and especially it allows jumping to related items from return-types, template-parameters, inheriters, base-classes, overriders, it allows showing the preprocessed text of macro invocations, showing all declarations from include files, jumping to direct source-locations, searching uses, and so on. When full-project parsing is enabled, this mostly surpasses the quality of what doxygen shows, since it can deal with C++ specifics like templates or macros really well. The Code Browser always shows informations about the item currently under the mouse- or text-cursor in the document, unless the little lock at the top right is activated, which preserves the view. Since a real developer hates using the mouse when in hacking mode, the navigation widget is completely keyboard accessible. – By pressing the ALT key, you will in some way get presented a navigation-widget. While you keep it pressed, you can navigate within it using the arrow-keys and the enter-key. Once you release ALT again, it will again disappear, unless you push and release it really fast, which equals a “toggle”. On this screenshot you see how the first item in the completion-list was expanded because ALT is pressed. The same thing is possible within all quickopen lists. This also works directly within the editor. 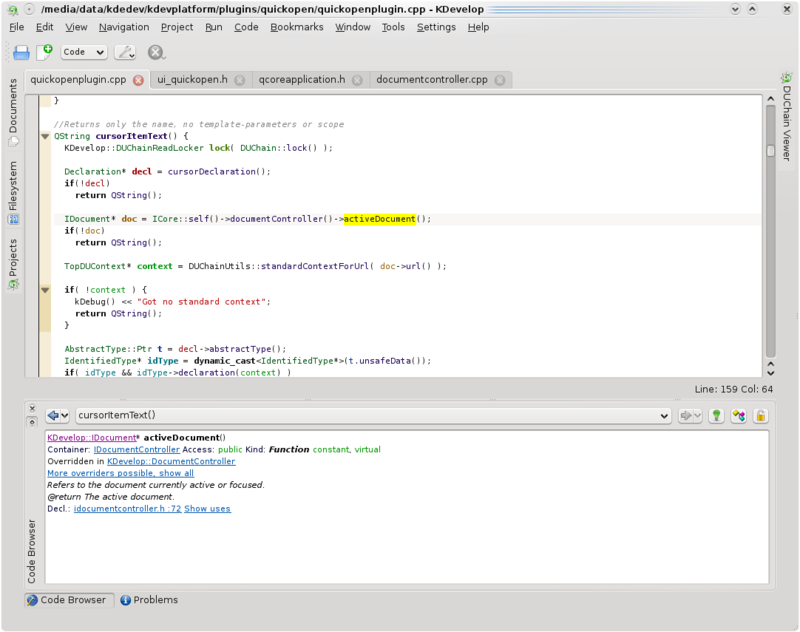 When the code-browser is visible, you can always navigate within it using ALT+Arrows. When the code-browser is not visible and ALT is pressed, the following keyboard-accessible tooltip is popped up, and disappears once ALT is released again. So thanks to the Magic Modifier, you’re always just a single keypress away from the semantic information behind your code. Sometimes when not in hacking-mode, it is comfortable to browse through the code comfortably without any keyboard-interaction. One way to achieve this is by using the new navigation tooltip I have added the last days, or the code-browser, by first pointing at the interesting item. However due to the duchain structure, the complete document could be interpreted as a single hyperlinked document, where each use is a link to its declaration. While pressing either CTRL or the Magic Modifier, you can click onto uses directly in the document, and it will bring you directly to the used declaration. The mouse-cursor will change to a hyperlink-style pointing hand when this is possible. For even more comfort without any keyboard interaction, it’s possible to go into a permanent “browsing” state, by clicking the little green lamp toolbutton in the code browser. So now you have a lot of navigation tools at hand, which all together allow really efficient working and browsing. I recomment every KDevelop user to memorize all of them, so you have the right tool at Hand in the right moment. In the last weeks I’ve once again spent quite some time on the duchain backend. Parsing and especially update-checking is a lot more efficient now, somewhat less disk-space is consumed, several consistency and crash problems have been fixed. Also tons of bugs in code-completion and general C++ support were fixed, the shown items in the completion-list are now intelligently shortened when they are too long by leaving away template-parameters. The completion-list in general looks better now with less colors and lighter icons, I’ve implemented the consistent “Magic Modifier” navigation, and tons of other stuff that I don’t remember. Just by the way if you’re wondering why my development speed is so fast at the moment: Soon I will begin working on my Diploma Thesis, which will leave a lot less time for KDevelop. I will be working on a C++ project though, and of course I will be using KDevelop4, which 1. means that I will definitely not lose KDevelop out of focus, and which 2. means that I want KDevelop to be in a good state until then. What makes me a bit sad is that the rest of KDevelop is not really taking off. 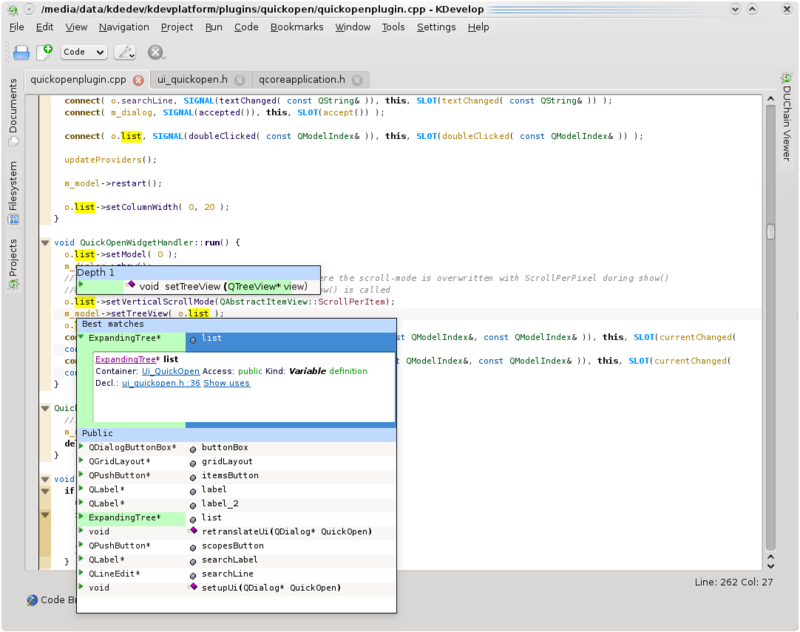 Debugger, project-management, documentation-integration, etc. all still need quite some work before a 4.0 release. One interesting thing is that Aleix Pol Gonzales has been improving the cmake duchain support, which means that many of the described features will also be available while working on cmake files at some point.